A stair tread is defined as the horizontal steps upon which individuals step. We offer a plethora of design options for homeowners and contractors when they are in the process of designing a staircase. Options can range from glass, to wood, to steel, and so on. While they may seem subtle, stair treads can complete a staircase design by complementing it with simplicity, elegance, or a bold statement. Since our company began in 1983, we have built over 16 million staircases, which means we have also built 54 million stair treads. To celebrate this achievement, this week we will travel down memory lane and highlight some of our favorite stair treads. Our first featured memorable stair tread is this blue glass staircase. This staircase was constructed for a residence in Arizona and was originally designed for a commercial space. 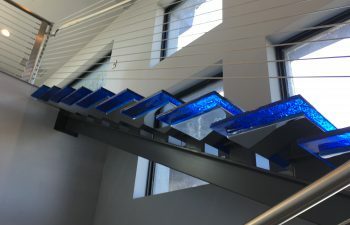 With clean lines and a unique texture, the beautiful blue glass stair treads enhance the home’s modern style. The open riser structure of this modern stair enhances the openness and allows the stunning glass to truly shine. The brightly colored glass transforms these modern stairs into a sophisticated work of art. The striking combination of stainless steel and glass creates the perfect balance of strong durability and minimalist design. Versatile and industrial, these elements capture the essence of modern architecture. Check out our glass staircase gallery to see more examples of glass staircases. 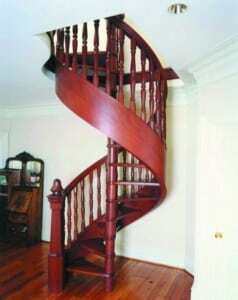 Our second featured memorable stair tread is the red wood spiral stair. This spiral staircase utilizes eye catching red wood to create a traditional look while also grabbing the attention of anyone who walks into the residence. With an elegant wooden baluster system and striking newel posts, this project is completed by lightweight, open rise stair treads with a rich red hue. To see more examples of spiral staircases, check out our spiral staircase gallery. Our third and final featured memorable stair tread is an elegant curved staircase completed with marble treads. This project was completed for a residence, and we worked closely with the homeowner to create a look for modern sophistication. 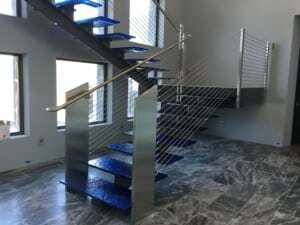 To complete this design, we used a unique combination of glass and stainless steel for the handrail system, which stretches up to the overlooking balcony. The marble stair treads were employed to finish the sophisticated and elegant air that the homeowner was searching for. 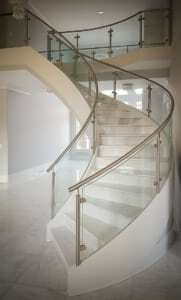 Check our glass and stainless steel staircase gallery to see similar staircases. Learn more about our approach to partnering with homebuilders, general contractors, and architects. From inspiration to installation, our team is committed to designing and building the highest quality custom staircases. Contact us to discuss your next custom staircase project.